The Path of the Horse is a Registered Charity with the Australian Charities and Not-for-profits Commission. All proceeds to the Charity to support our clients, horses and operations. Dean Mighell is the Founder, Director and a Practitioner. 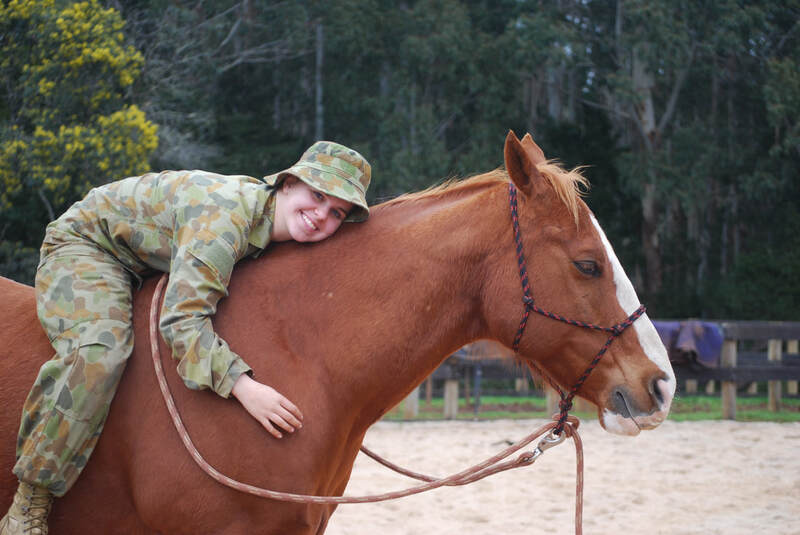 Dean trained with and is certified by the Equine Psychotherapy Institute as an Equine Assisted Learning practitioner and has also done trauma training and is currently studying at the Gestalt Institute of Australia. Karyn Jones is a Director and a Practitioner. Karyn also trained with and is certified by the Equine Psychotherapy Institute as an Equine Assisted Learning practitioner. The EPI Model is a holisitc Equine Psychotherapy and Experiential Learning model informed by *Common Factors Psychotherapy Research Outcomes *Contemporary Trauma practice *Mindfulness *Gestalt Therapy *I-Thou Horsemanship and *The Way of the Horse. Our Board is made up of volunteer Directors committed to the Charity and good governance. We are greatly assisted by a dedicated group of Volunteers, Veterans and locals. At the Path of the Horse we aim to assist people of all ages and from all walks of life who seek better mental health and well-being. Our work is a powerful, effective and empathetic approach that assists our clients make positive change. We help people become more self-aware about themselves which will enable them to make clearer choices about their lives. Through bringing about ‘awareness’, we work on ways to help heal, manage, build resilience, enjoy better relationships, and maintain better mental health. We welcome people just the way they are along with all their feelings and emotions. We proudly support veterans, emergency service personnel and their families and others better manage conditions such as PTSD, anxiety and depression. We help young people discover coping mechanisms and assist them to understand their feelings and make aware choices. We work with people with Autism, those battling addictions, self-harm, grief and many other conditions. Horses model some wonderful behaviours for us to follow when we learn to listen and walk their path. Horses live in a constant state of awareness that has enabled them to survive for millions of years. They always notice what is happening in their environment, what is happening with their feelings and their bodies. Horses have an amazing ability to release stress and a truly unique capacity to share their empathy with humans. They never judge, they are completely honest and are our much-loved assistants in the healing process. They are great listeners too. No previous horse experience is required, just an open mind and a willingness to encounter a new way of allowing yourself to feel. You may be invited to meet the whole herd, take time groom one, participate in controlled lead work, perhaps a mounted experience or just share space with one of the herd that you feel drawn to.